Here we gather by the river, October 29, 2005. Indian Summer! 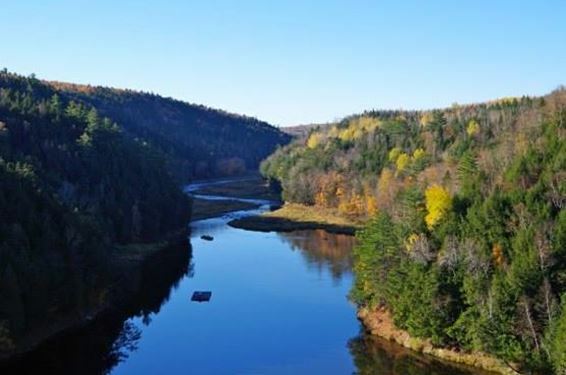 The Eel River marks the eastern end of the ancient Maliseet Trail that links the Saint John, St. Croix and Penobscot watersheds. The section from the village of Benton to the Mactaquac headpond of the Saint John River, however, is not really part of the trail. It is too steep and fast to permit westward travel upstream from Meductic to Benton. Many stretches in this section, I suspect, were too steep for downstream travel with the birch bark craft of yesteryear, at least without several lengthy carries. 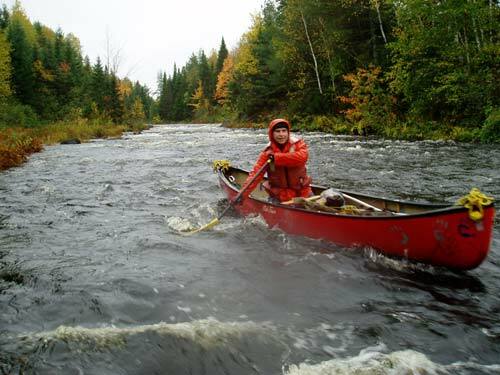 They provide heady challenges for the pleasure seekers in our plastic kayaks and canoes of today. We gathered at the Ducks Unlimited dam just upstream of the covered bridge in Benton on the last Saturday of October. There were seven paddlers in all, in four canoes and two kayaks. 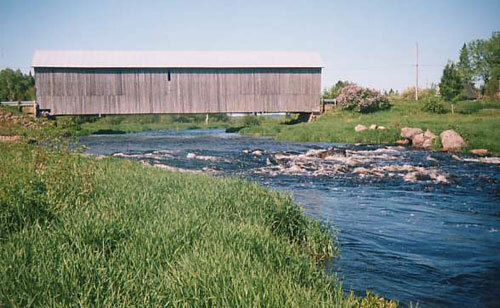 Covered bridge at Benton. The best put-in spot is 200 metres upstream on river right looking upstream, above a small dam. 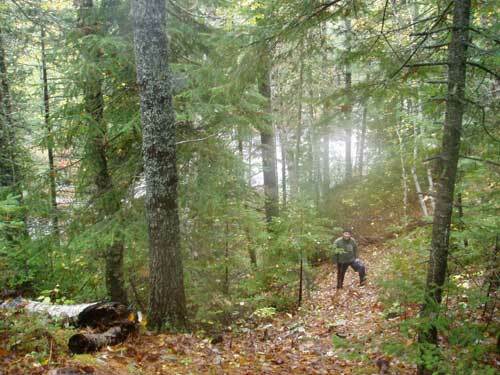 To go upstream from the low-head dam at Benton would be to follow the Maliseet Trail up to the Eel lakes, through broad deep marshes connected by several quickwaters. 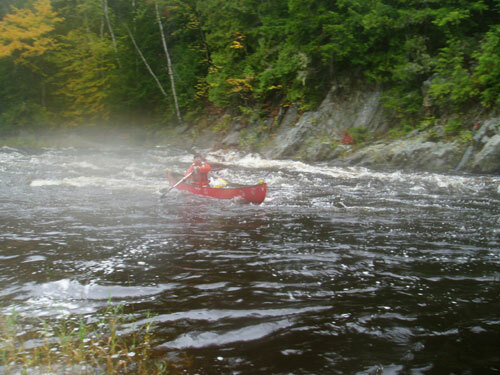 My friends Sammy Solo and Matt Hopkinson had followed the length of the Trail from Hillman on the Saint John River over to the Penobscot in May, along with several other folks with whom I would be paddling today. However, I chose not to mention to my fellow paddlers that I had paddled with Matt and Sammy. I decided to get to know these folks on my own terms without dropping names. A month of hurricane storms and nor'easters tracking north from the Gulf of Mexico had swollen the river to over freshet height. There was just a foot or so over our heads to spare as we glided under the two bridges at Benton and into the deeply forested river valley below. This was my first trip down the Eel, and I was glad to be running it with folks who were familiar with the river. There is a falls an hour or so downstream of the village, and I was not familiar with the takeout above the falls. I had heard that there was a steep drop just before the falls that might be lined, depending on the current. Plus, others had told me there was a canyon below the falls that might be run at certain water levels. A trip in the fall is always special, the foliage is bright and the bugs non-existant. This is my friend Sammy Solo. I haven't tumbled over a waterfall yet, and I'm not anxious to run any risk of this nature that can be avoided. I also knew there were many stretches of rocky whitewater below the dam, some of the longest steep stretches in the province. I had been looking forward to running them for many years, and the portage was the price to pay for this privilege. The run down to the falls was exciting, with almost all the rocks under water due to the nearly constant rain of the month before. There were any number of paths to follow down the several ledgey drops we met every few turns. My buddies told me this was the highest level they had ever run the Eel. Turns that had been tight and technical a month before were wide and wavy today. The river ran nearly due east, mirroring the glare of the late-fall morning sun into our eyes. 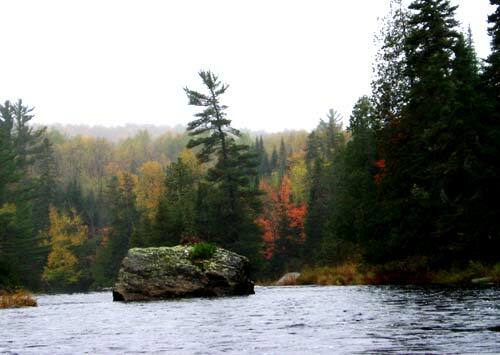 This shot looks toward the big rock that marks the beginning of the portage trail on the left bank. The transmission towers downstream are not visible from this angle. Soon we emerged into a wide pool, and my buddies prompted me to swing river left to the bank, well above the horizon line at the far end that flashed with occasional leaps of spray. A rock about the size of a large car, fronting a small treed island, dominated the pool in the centre. It was skirted by rocky drops on both its sides. Sammy Solo poses at the brink of the fall. A transmission tower could be seen several hundred metres directly downstream high up on the right bank. I took careful note of these markers, to ensure I will recognize this compulsory portage the next time I come down this stream. The first tight drop precedes the main ten-foot fall about a hundred feet upstream. It was too rough on this day to either run or line the boats from here to the start of the portage trail, which started on the left bank just above the lip of the main fall. There is a faint trail here just at the edge of this first drop. 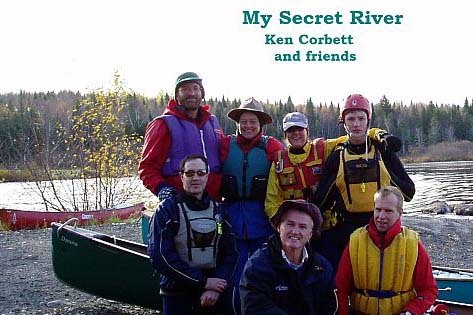 However, since we had six boats and the current was very pushy, we chose to start our portage about thirty feet upstream. This was a mistake, as the thickets were rocky, thick and wet. I can't vouch for the others, but I was bushed after hauling my Mad River up the bank and through the tangled brush and slippery rocks, to emerge finally onto the smooth trail near the falls. Several times I had to stop to cool down and catch my breath. And I thought I was in shape! The trail is wide and offers easy footing, ending in a steep drop to the pool at the bottom of the canyon. There is a vantage point at this end of the portage, where you can part the spruce and cedar boughs to gaze on the canyon runout upstream. It was a long, aerated froth of fury through which no boat could hope to emerge unscathed. 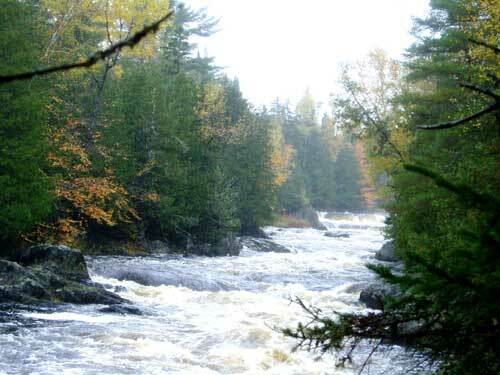 Looking upstream from the end of the portage trail. After all had finished the portage, we ambled back up the trail with our packs to a mossy patch beside the falls to enjoy our lunch. The falls themselves are a straight pounding drop perhaps ten feet high, followed almost immediately by several steep three and four foot ledges, then a steep narrow canyon for several hundred feet. Sammy Solo steps down the bank at the end of the trail around the falls and canyon. 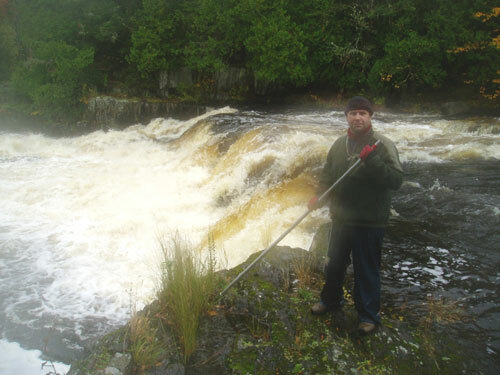 Legend has it that a group of soldiers on maneuver from nearby Camp Gagetown attempted to run the falls and gorge in a raft some unknown number of years ago. Several of our group mentioned the legend as we surveyed the tumbling froth from the brink, but no one could shed any light whether they had succeeded or come to grief. We launched in single file at the end of the portage, sweeping river left over a ledge and around a rounded cliff face to emerge in the wide pool below.The current is steady as you approach Scott Siding maybe an hour or so downstream, where a small cabin and a few outbuildings cling to the right bank. Canoeists can also run a shuttle from the headpond to start here below the falls, but it is actually much longer than the ten-minute shuttle to Benton. Sammy negotiates a ledgy turn on the lower Eel. This is the first truly long and lively runnable rapid on the lower Eel, which we ran with little difficulty due to the high water. The rocks were easy to avoid on the outside bank river right, but the high water also created a train of high waves and steep troughs on the inner edge, which could easily swamp an open boat running directly down their track. I confess I had fastened a spray cover over my boat, which offered me a greater degree of protection from swamping. I was able to edge into the bigger water whereas the other open boats often chose to skirt the curling wavetops. There were many stretches of calmer water as we progressed downstream where we could go to shore and bail out our boats. The rapids grew higher and longer, and appeared more frequently as we neared the flank of Annie's Mountain, the last major hill above the Mactaquac headpond. Sammy runs the last rapid on the Eel. The bulk of the Mountain signaled the longest and biggest stretch of rapids. I could look straight up the steep hillside to a stand of birch near the summit, but only briefly, for the quickening current demanded my full attention, with a patchwork of huge rocks studding the stream. I came perilously close to broaching at the head of the island below the hill, and slowly slid off upright with a very loud sigh, well maybe a whoop, of relief. We were fortunate, in that there was always a sneak route of calmer water down one side or the other in the high water, as the current slammed into steep walls and sped in huge standing waves around tight corners. My friends told me stories of earlier trips when the water was lower, where there had been fewer or no sneak routes, and several swims were taken down long rocky rips before reaching the shore. Shortly thereafter, the spans and pillars of the Trans-Canada Highway bridge join the banks, and the current is drowned in the deep stillness of the headpond. A short calm-water paddle leads to the riverside park in Meductic, and after handshakes all around and promises of future expeditions, our crew parted ways. An hour's drive brought me back home into Fredericton. Eel River mouth. Image contributed by Evan Young. Pictures graciously contributed by Sammy Solo and Mike Grant. 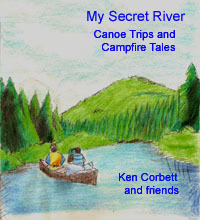 Visit Sammy's Maliseet Trail adventure page! Pete, I hear you and your buddies took a close look at the falls on the Eel and decided to run the rapids in the canyon just below the main drop. Tell us how you made out! Check out Dave Melanson's Eel River video at this link! 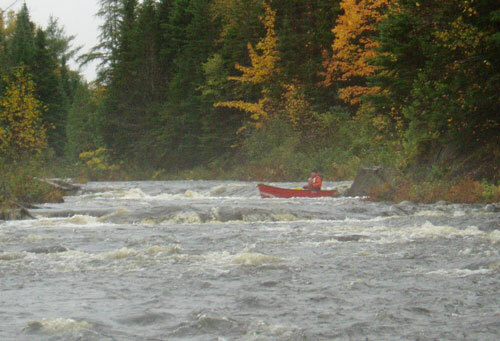 The Maliseet called the Eel River "Matawamkituck". It means; "rapids at mouth where it shoots into main river" I like this name better myself.